I have just had the nicest surprise from Mariann in Hungary - she just e-mailed me that she has done the entire tutorial WhatCanIDoWithOneLittleSnapshot? and she is now giving away the items she made as a kit on her blog! She even named it after me! Fantastic work Mariann and THANK YOU SO MUCH for your prayers, posts, e-mails and encouragements, to say nothing of the award you gave me! You are so good to me and I pray God returns your blessings on you until you just can't take any more! Everyone should check out her kit here and if you didn't pick up my tutorial, you can still get it here. For those who are praying for my friend Jenifer, THANK YOU! She was just released from the hospital a few minutes ago, but this is far from over. Please keep her in your prayers as this will take a genuine miracle of God. She's an awesome woman of God and you'd love her if you knew her. And since I'm thanking people, a giant THANK YOU and hugs to the 16 people who have purchased My Favorite Things so far to help support the blog. Little Boo sends slurpy licks of gratitude too! It's still available in the right column. 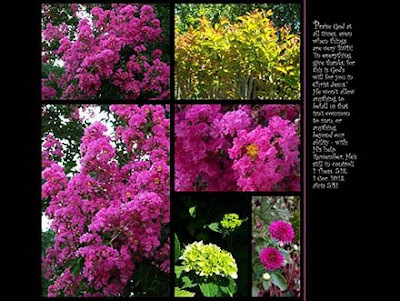 I'm sharing this page from a book I published, "Surrounded By God's Glory", which combines photos of our yard and lessons God has taught me in that "special way", so you can see the entire plant. The lovely greens are how it looks before it's blossoms. How gorgeous are those blossoms? They come in several colors and are absolutely gorgeous once temperatures are in the 90's consistently. I've seen the bushes nearly two stories high! What a sight! Now while the bridegroom was delaying, they all got drowsy and began to sleep. They were Christians as they were all invited to the wedding feast. They all had oil to begin with. The oil is the Holy Spirit of God. But the foolish virgins were not diligent in their relationship with God, so they did not keep a good supply of oil/Holy Spirit. When the moment came, their relationship was gone through neglect. They had no Holy Spirit any more...and remember, it is by the Holy Spirit that we are marked for salvation. Though they understood they must have it and scrambled to get more at the last moment, they were unable and they were shut out with the lost. Be diligent all the more as we see the day draw near! 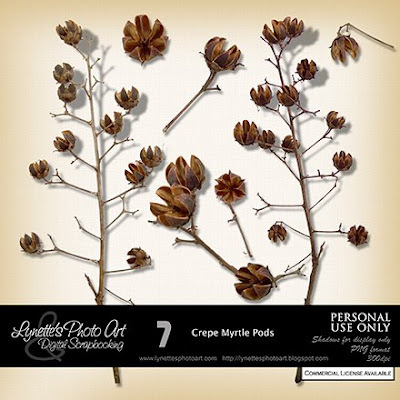 The dried crepe myrtle pods are great. What a nice change (for me, anyway!) from all the duplication out there. Thank you so much for this Freebie. I want to let you know that I posted a link to your blog in Creative Busy Hands Scrapbook Freebies Search List, under the Elements or Papers post on Jul. 05, 2009. Thanks again.